this silver torah pointer (Yad) was made in Moskow (Russia) in 1873. It bears a small turquoise stone and the marks of silversmith (IA) and essayer (VS) in cyrillic. 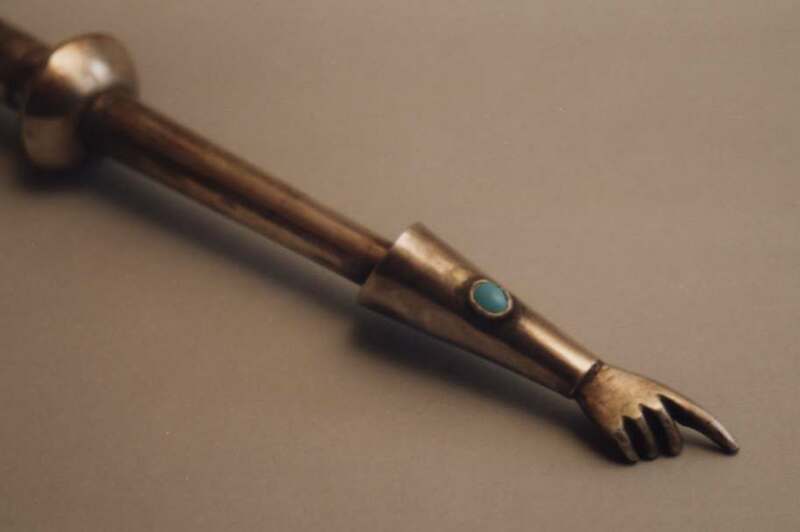 The 'pointer' is an element often included in Torah decoration. It is called 'yad', the Hebrew word for 'hand'. The pointer usually hangs on a chain from the Torah staves. Because everything connected with the Torah is particularly sacred, it is considered disrespectful to touch the text when reading the passages. This is not only for reasons of respect but also because the constant touching with the finger would eventually soil the Torah and require it to be reinscribed. When not in use, the yad is hung next to the Torah shield and over the mantle. This Russian torah pointer (Yad) was bought from an Italian dealer at an Antique Fair.